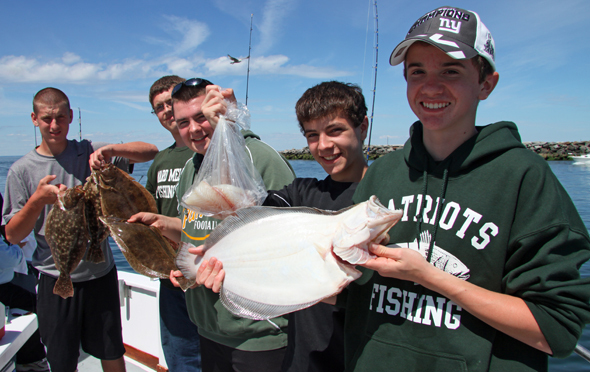 Members of the Ward Melville High School Fishing Club show off some fluke caught aboard the Port Jefferson open boat Celtic Quest. 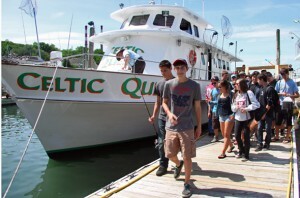 What a fun trip I had sailing out of Port Jefferson aboard the open boat Celtic Quest with the Ward Melville High School Fishing Club last Sunday. The club has over 40 members and is growing more popular with students every year. So far, the Ward Melville High School fishing club has been right on target as every student I spoke with had nothing but praise for the program. On Sunday’s trip, the club chose to target fluke even though they knew catching porgies would be a sure thing. Indeed, they were, and the summer flatties this day also reinforced another important lesson – sometimes you really have to earn your catch. In addition to the club’s regular members, some parents accompanied the students, and there were a few kids from the high school and middle school who weren’t officially club members due to other commitments. The Ward Melville High School Fishing Club has over 40 members, a diverse mix of young men and women anglers ranging from freshmen to seniors. Here’s club advisor Bob Wilson, right, enjoying some quality fishing time with angler Sean Walters. Note the light spinning sticks. As fishing clubs go, this one is particularly active. Over the winter club members tied rigs, bucktails, teasers and flies. They learned about popular species to target in our waters and enjoyed a knot-tying contest and fundraising event in the spring. This was followed by a pair of porgy trips prior to the fluke excursion. Central to the club’s success was the time donated by volunteers including Captain Neil Faulkner and Al Goldberg (914-907-9267) who taught rod-building, Barbara Fusco of Love2Fish Charters, John Skinner from Noreast.com, fly-tying specialist Harvey Cooper (pnutbunker@aol.com,) Capt. Tom Mikoleski of Grand Slam Charters, school librarian Warren Dennington, and club advisor Bill Lapp. 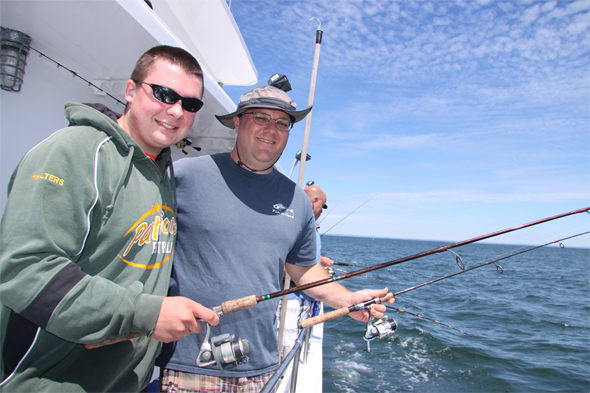 Also joining the kids on Sunday’s trip was Ward Melville High School vice principal Michael Owens, a seasoned angler and outdoorsman. With support like that, it’s likely the program will continue to grow. Already, Wilson and crew are making plans for next year. They’ll start with meetings and fall fishing trips in September, and begin organizing for their spring fundraising fishing show to be held at the school on March 7, 2015. 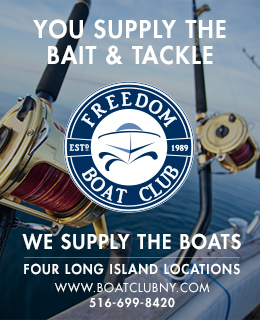 Mark your calendars now, because that show was great last spring with high-quality speakers, a variety of vendors and, of course, club members growing into their newfound role as recreational fishing ambassadors. 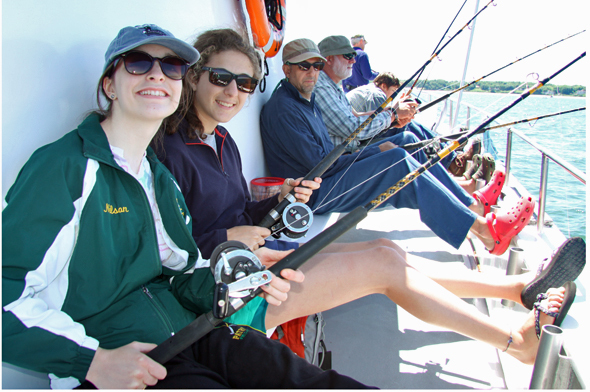 Editor’s Note: For more info on the Ward Melville High School Fishing club, contact Bob Wilson at Bwilson1278@gmail.com. 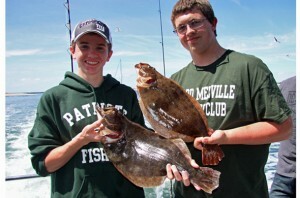 Successful anglers show off a pair of keepers that fell to bucktail and teaser rigs jigged on a shallow flat in Smithtown Bay. The Ward Melville High School Fishing Club departs after a fun day aboard the Port Jefferson open boat, Celtic Quest.